What can this Scary Black Man teach us about blogging? I had to up the anty on that headline to be sure it brought you over here to read this post. 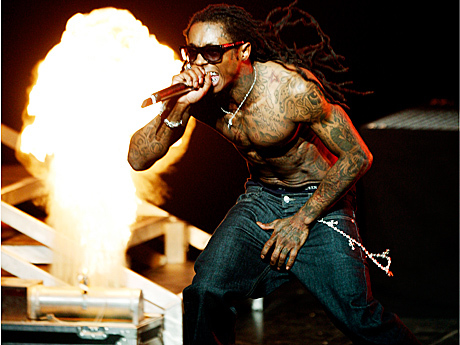 It’s not really about a scary black man – unless you find Rapper Lil Wayne (with his tattoos & bling bling) scary. This post is really about finding the inspiration to create content for your blog. Hey listen, I’m not gonna lie…sometimes I just don’t know how to find the inspiration to blog as often as I know I should. Most experts say that we need to post at least 3 times per week to be effective online. If you’re like me that can be a daunting task. But it’s true! For your blog to be relevant you need to keep feeding it content. Just the other day I was watching VH1 Behind the music with rapper Lil Wayne and he said something so profound that I felt it was my duty to deliver this thought to you. You see, he’s not just a rapper, he’s also a businessman, and artist. As entrepreneurs I think we can relate to “wearing many hats” in our business. So here’s the valuable tip I got from Mr. Lil Wayne. When he was working on hist first album he had tons of ideas for new music. The problem was the label only wanted 10-15 tracks from him. As an artist he knew that if he didn’t get all these tracks out right now he’d never create anything new. So he decided to record everything he had on his mind to make room for something new. Are you wondering how this relates to your blog? What I’m left with is a bunch of unwritten post in some sort of back log (in my mind) not allowing me to create anything new because of all the old posts I should have written weeks ago. Some people call it writer’s block, I call it laziness. So why don’t you take the Lil Wayne challenge to improve your blog? What ideas do you have for new posts? Which ones have you put on the back burner? Take one day this week to write all your posts, every one you can think of. Don’t bother with formatting or photos, just get the words and ideas out of your head so you can start feeding your blog new content. Now you’ll have some room in there for new ideas. As you get ideas for new posts, write them out when you think of them. Try this for a month, then come back and tell me how hard it is to find inspiration to blog. Great post. This is what i do: When I get a blog idea, I type into my blog as a title and save it as a draft. I can do this from my blackberry. You could do the same by writing ideas down or putting them into your smartphone as a task. It helps keep ideas flowing. That's an awesome idea! I just started using the wordpress app on my iPhone to do something similar. allright…I’m drawing the line … the headline is racist and I can’t believe you realized it, so I give you the benefit of the doubt…but I’m watching you very carefully!!! I respect your opinion Mark, but I disagree. There was a great discussion around this post on Facebook, did you see it?